Abrbandi is the gloriously romantic, Uzbek term for the resist-dye technique perfected in the lush Ferghana Valley, usually referred to as ikat. It means 'to bind or tie the clouds' and if textiles are your interest, a trip to the Ferghana Valley is indeed a heavenly experience. Margilan, about 12 kms from Ferghana City, is the centre of silk production. The famous Yodgorlik silk factory is here, where you can view the whole process from cocoons to finished silk cloth. It is a labour-intensive and time-consuming process using only natural dyes. Founded in 1972 and now privatised, Yodgorlik makes a fascinating visit. Fabrics, scarves clothing, and even wool carpets with an ikat design, are available at the factory's boutique. Another important ikat stop is the training centre of Rasuljon Mirzaahmedov, at the Sayyid Ahmad Huja Ishan Madrassah in Margilan. A much smaller operation than Yodgorlik, and in a most picturesque setting, you can view the threads being bound, dyed and woven into cloth. Mr. Mirzaahmedov collaborates with designer Oscar de la Renta and has been at the forefront of the revival of silk velvet ikat. (The training centre also houses a woodblock printing workshop, where the son of master Salijon Ahmadaliev is happy to show you this process). Once again, the centre houses a small shop. 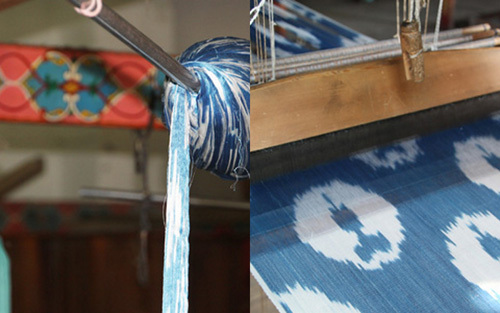 From dyed, patterned silk threads (left) to woven cloth (right) using just two colours. Some designs have eight colours. However, the best ikat fabric bargains are to be had at the Kumtepa bazaar, about 5 kms from Margilan. This huge market operates only on Sundays and Thursdays. Head down to the very back of the market and you will be rewarded with several rows of exuberant fabric stalls. Much of the ikat weaving in the Ferghana Valley is done in private homes, and Kumtepa is where you will see women hauling 60-metre bundles of fabric to sell directly to the stall holders. It is marvellous to see these women open their carry bags, unfurl their riotous fabrics then negotiate with the vendors. Uzbek women like *bling*, and the current fashion is adras (a cotton/silk mix) woven with gold or silver thread. On a recent visit, there were hundreds of different patterns in this style. Not so easy to find are the pure silk ikats and the plainer adras cloth. As these are presently not the best-sellers, they may be under the counter. It is worth persisting. With the help of my guide, I picked up some exquisite pure silk ikat for about $5 per metre. The Ferghana Valley is not included in the 16-day Uzbekistan tour. However, Uzbek Journeys offers a range of interesting Ferghana Valley tours available before or after your tour. In Bukhara you will have the chance to see Babur, an ikat weaver from Andijan, at the loom in his workshop set up in a caravanserai. 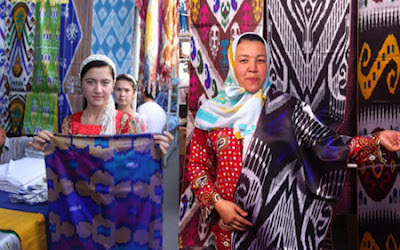 In Samarkand and Bukhara it will be possible to purchase fine quality ikat fabrics, including silk velvet, as well as scarves and other accessories.